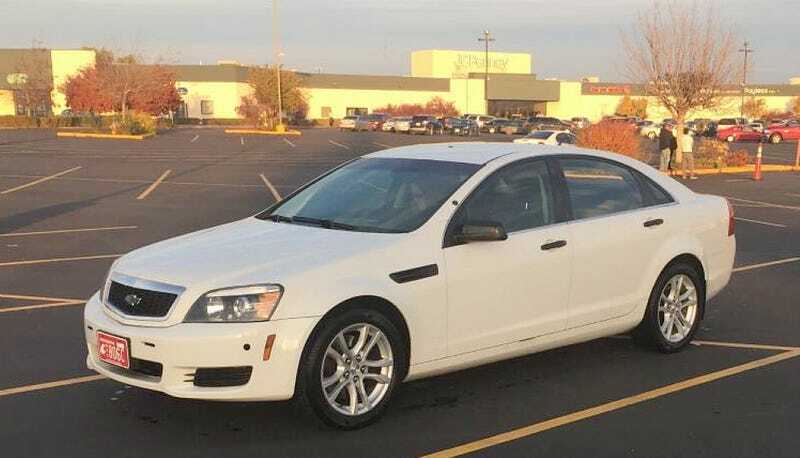 For $8,500, Would You Cop A Deal For This 2012 Chevy Caprice PPV? When you were a kid did you play cops and robbers? Which side did you choose? Yeah, that’s what I thought. Today’s Nice Price or Crack Pipe Caprice lets you roll like the Po-Po, that is, if its price isn’t criminal. Dammit people! You’ve got to stop with these nail-biter 50/50 vote results. It makes my job all that much harder, and the last thing we all want is for me to be hard. Wait, that didn’t come out right. At any rate, yesterday’s rotary-packing 1962 MG Midget (I still contend that it was a Sprite) earned itself an extremely narrow 53% Nice Price win, and that was despite having a radiator held in place by Zip Ties and a child’s imagination. If you’ve ever imagined you were a cop—you know, internalizing pulling over that clown that just guttter-sniped you rather than just giving him the finger—have I got a car for you. Here we have a 2012 Chevy Caprice Police Patrol Vehicle (PPV), a car that prior to its current gig pimping hard on the Craigslist was employed in some sort of vehicular government job. We can assume that as Chevy only offered these cars to law enforcement in the U.S. and Canada. Obviously law enforcement can sell them off when they are done beating them up. The Caprice started life as a Holden Caprice down in Australia, back when the Aussies actually built cars. It shares a number of bits with the Holden Commodore that the U.S. received as the consumer-grade Pontiac G8, but the Caprice is almost four-inches longer than that car and in this form a lot more Chevy-er. The PPV was offered with either an LLT V6 or a six litre L77 V8. This one rocks the 360-bhp V8. Behind that is a 6L80E six-speed automatic and the power is sent to the rear wheels so yes it will do donuts. As we all know, cops freaking love donuts. Bodywork is in plain-wrapper white with black painted side vents, door handles and widow trim. Someone took the onus to add some 18-inch alloys off of a bitchin’ Camaro which does add a bit of panache. All vestiges of its previous vocation—a-pillar spot, push bar, light bar—have been removed as the decommissioned car has moved into civilian service. Inside too you’ll find just traces of its former life. The spit shield, electronics mounts, and riot gun racks are long gone, although the body fluid impregnable seating surfaces in back and oddball console with its driver-oriented shifter remains intact. I’m guessing that the speedo is pretty accurate too. Based on the photos in the ad the car looks like it’s been getting some bug-splattering highway miles, and it appears it could use a good wipe down and maybe some Febreze. The seller says it comes with 117,000 miles on the clock and a clean title in the glove box. The ad also makes claim that the car “is very quick, handles well and drives and shifts nicely.” I’ll bet people get out of its way when they see it in their rearview mirror too, so it’s got that going for it. We’ll have to decide if its $8,500 price tag also has it going on. These were $32K American when new and even though cop duty can be hard on a car, that’s a pretty good discount over just five years. What’s your take, does this PPV seem worth that $8,500? Or, is this a former cop car whose price means it couldn’t get arrested in this town? Seattle WA Craigslist, or go here if the ad disappears. H/T to no-handle Jason for the hookup! For $5,900, Would You Get Down With This Rotary 1962 MG Midget? For $6,500, How About This Low Mileage 1981 Chevy Caprice Diesel?